Wordless Wednesday: How Could I Resist? I’m actually a bit late with my post this week! It’s been a busy one. I very nearly used this image for last week’s Travel Theme: Simplify, as the photo was taken in a busy park with numerous distractions in the background that I’d needed to eliminate. 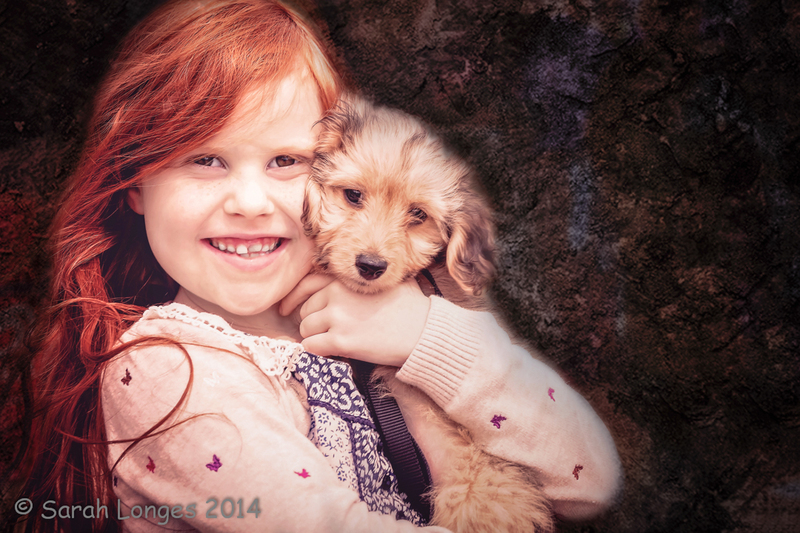 I decided to do this using several textured masking layers in Photoshop, to draw the viewers focus back to the endearing portrait of the girl with her young puppy. You can create your own textures to use in this way simply by photographing interesting textured scenes or objects. Rocks, fabrics, bricks and handmade paper are all great for this! There are a number of websites offering free texture downloads for personal and commercial use and right here on WordPress you can visit Public Domain Textures for a wide selection to choose from. Thank you to Leanne Cole for introducing me to the blog, for which she is a regular contributor! This is Mylie with their family dog, Samui. Taking this photograph transported me to my childhood, reminding me of the relationship my siblings and I had with our first family pet, William. I thought it would be a great entry for Monochrome Madness. Monochrome Madness is a weekly challenge set up by blogging friends, Leanne Cole and Laura Macky. I love both of their blogs! Lots of inspiration, advice and wonderful images. This is Enzo. He’s just four months old and belongs to my cousin and her family. My Aunt is dog-sitting whilst they’re on their summer holidays. Today she, my mum, my sister and brother-in-law all came along to Basingstoke Canal with me for a walk. It was all new to Enzo and he was soon immersed in doggy heaven! Water, ducks, insects, sticks, people, bikes, babies and other dogs! The excitement was almost overwhelming. He’s a very good little dog though and it was lovely watching him bouncing about with joy and jumping in and out of the shallows. Do come again Enzo and bring a ball to throw and fetch! Please bring your family too, I’d love to see them.